In my neck of the woods, it’s been about two months without any measurable rainfall. I decided several years ago, most plants in my garden were on their own for survival. As you can imagine, they’re not looking so great right now. I’d plant the right plant in the right place, nurse them along until they got established and then it was up to them. I’ve softened a bit since then. Now, I provide occasional supplemental watering to help plants survive summer. But in an effort to save time and still water properly, I’m using some very efficient methods. First, I water deeply but infrequently. This saturates the entire root zone and minimizes the total loss of water due to evaporation. By watering only about once a week, as the surface area dries, moisture is still available more deeply, where roots will grow in search of available moisture. By watering infrequently, roots are encouraged to grow down to find water. All of my methods of watering now incorporate this deep but infrequent watering regime and drip irrigation is a great place to start the discussion. For beds and containers, the best way I’ve ever seen to keep plants hydrated right at the root zone is with drip irrigation. The water is delivered through a supply line which is typically flexible, plastic tubing. Along the supply line, small holes punctured into it where needed, allowing water to drip out at those points. Flexible tubing can also be tapped into the line, directing water precisely to the base of any plants or containers. The rate at which water drips from the end of the tubing is controlled by a plastic tip called an emitter. They come in different sizes depending on your desired flow rate. Drip irrigation kits and supplies can be purchased at garden centers and home improvement stores. They’re easy to install. Add an automatic timer and you’ll have a worry free way to water effectively. There comes a point where it becomes impractical to extend a drip irrigation line too far into your yard or to a remote setting of your landscape. 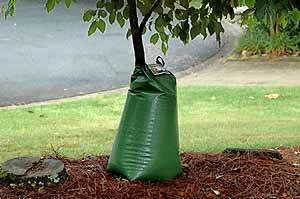 That can create a problem as you think about efficient ways to water trees and shrubs. Treegator is a product that addresses that very issue. It’s essentially a portable drip irrigation system in a bag. The ‘bag’ is a leak proof bladder that has tiny pinholes in the bottom. Wrap the Treegator around the trunk, fill it with water and over the next 6 – 12 hours water is released slowly into the soil. There are currently two models. One is a cone shaped style that holds 20 gallons of water. The second is a more low-profile style that holds 14 gallons. It’s the ideal solution for watering trees and shrubs in a way that allows the water to slowly soak the area around the roots. More information and ordering information is available through their website, www.treegator.com. The most critical phase of a plant or tree surviving is while it is becoming established in the ground. Getting sufficient water to the roots is critical. Having a way to deliver that water slowly enough to soak deeply into the soil is essential. Using the right drip irrigation method is a great way to assure that happens, no matter where your plants are located.